I was fortunate to know both of my maternal great-grandmothers. They passed away when I was in my early teens but I remember them well. They were formidable women with hearts of gold. One thing was for sure, you didn´t mess with either of them. 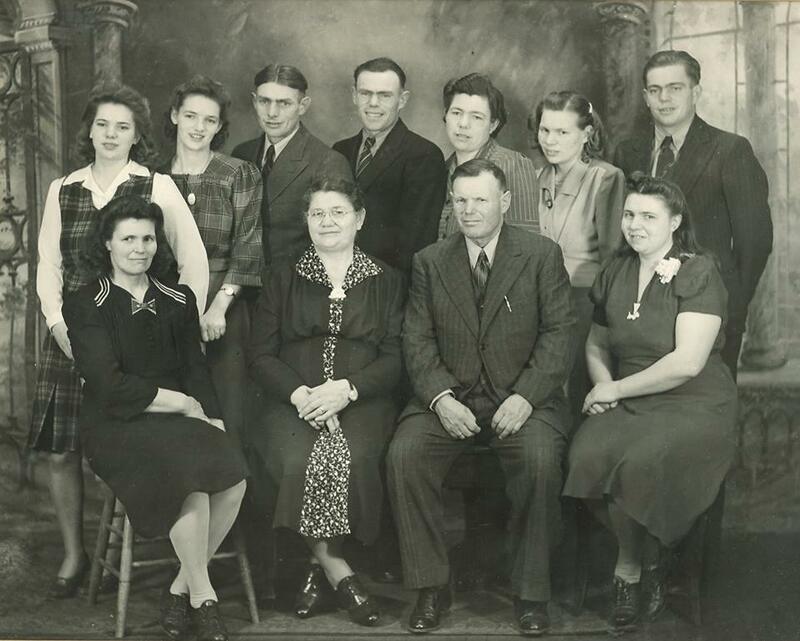 Both great-grandmothers were born into German immigrant farmer families living in South Russia and came to Canada at the beginning of the 20th century to help populate and develop the Prairie Provinces. They certainly did their part in populating the area as they had twenty-four children between the two of them! My grandmother´s mother, Katharina (Herrmann) Hoffman, arrived in Canada in 1909 from South Russia with her husband, three small children and another on the way. Being German, they could no longer safely stay in a country on the verge of a revolution. The Canadian government needed robust, hardy folks to settle the prairies. The steppes of Russia were very similar to the Canadian prairies, the price was right at one dollar and they needed a place to live. The brave family took the onerous three-week journey across the Atlantic on a cattle ship to Halifax, then on a train to their homestead in southern Alberta. A stop had to be made in Winnipeg so Katharina could give birth to her fourth child, my grandmother. They eventually arrived at their destination; a desolate piece of land with no house, trees, water or neighbours. A temporary house, built from sod blocks carved out of the earth made do until a wooden house was eventually built. The sod was plastered with mud and cow dung inside and out and then whitewashed. Great-grandmother decorated the walls with designs from a cut out potato dipped in beet juice. Katharina had seven more children once settled in Canada. Not all survived childhood as was the case in those days. A great cook, I recall her delicious German baking vividly. She grew a large vegetable garden, her home was kept spotless at all times and she made clothes for her children from flour sacks. She was a plucky, hardworking and resourceful woman who loved her family above all else. I am so lucky to have her blood running through my veins. My grandfather´s mother´s story is similar. 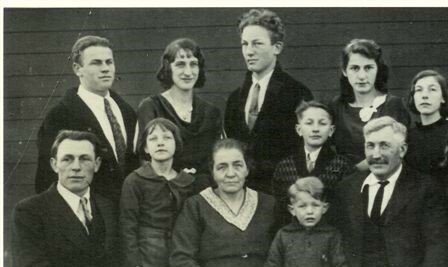 Also named Katharina (Stoller) Mehrer, she arrived in Canada from South Russia in 1911 with her husband and four children under four, the youngest only six weeks old. 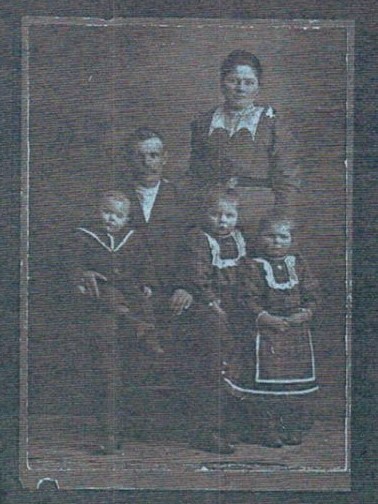 With these small children, they travelled through Europe by train, crossed the Atlantic by boat and then across the United States by train before arriving at their homestead in South East Saskatchewan. This young woman left behind a life of comfort and had to deal with homesickness, extreme climate, a new language and the death of an infant. Not only did she go on to have another nine children, she acted as a midwife to other members of the community, attending over fifty births. She also helped her husband in the fields. There was no time for self-pity. No matter the hardships, she just got on with it. I recall she was a tiny woman full of energy and determination. I love this story my great-aunt shared about an experience her mother, Katharina Mehrer, had in April of 1912, the first year they were in Canada. Her husband was out turning sod when he had some trouble with the horses. He called to Katharina, who came across the road, leaving the little ones in the house, thinking she would only be a few minutes. It took a long time before she returned – to an empty house. Panic-stricken she rushed out, calling for the little ones but all that greeted her was silence. After searching the yard she returned to the house wondering what she could say to their father. In the Kitchen, on one of the walls, there were six large hooks on which to hang heavy garments. On one of these hooks hung the long, black wool coat that her husband had brought from Europe. A long bench sat underneath. As she entered the kitchen she noticed a slight movement of the coat. She pulled it to one side and there sat four little people, sleeping and perspiring. Five-year-old John holding the baby and a little sister on each side of him. He explained to his mother that she was gone so long that he decided to keep them safe in case someone came to take them away. The little boy, John, was my dear grandfather who passed those nurturing habits on to my mother and me. Family was everything to my great-grandmothers who handed this value on down the line. These women believed in education and encouraged their children to get a good education and do well in life. Consequently, there are many successful people in our family. Both ideal role models, the Katharinas provided the attributes of determination, steadfastness and tenacity to the subsequent generations. Whenever I think of these two remarkable women, I appreciate the trail they blazed for the rest of us and am eternally grateful. I am who I am because of them. When I set a goal, I will do everything to achieve it. I am not afraid of hard work and my bosses have often commented on how much work I could accomplish and not break a sweat. I even made the trip back across the Atlantic to live in another country. Mind you, I did it without small children in tow and on an airplane, not a three-week boat journey. Most important, I had a choice. A freedom I also owe to both Katharinas. When things seem to go wrong for me and I have a bad day, I remind myself of what my great-grandmothers went through and carry on. I believe the strength of our ancestors does sustain us. The Hoffman, Mehrer and Foster Women Rock! If you have a story about an inspiring woman, please feel free to leave a link to your post in the comments section. Long may the two great ladies go on inspiring members of the family. They still are. You should meet my feisty granddaughter! Thanks, David. When I read stories of such women I feel uplifted and inspired. Back then must have been tough but the made the best and a success of things. That they did, Jacqueline. Thanks. Jacqueline, I always enjoy reading your posts “Mama Said”. You should write about her. I am honoured to have my story about my inspiring great-grandmothers featured on your blog. Thanks so much, Bernadette. It is my pleasure, always, to share these stories. Thanks, Niamh! It was tough but most of them just got on with it! There are so many pioneering women with similar stories. Here in South Australia’s Barossa Valley there is the remain of a very large hollow tree trunk which was home to a German family with many children for the first few years after their arrival. I can’t remember all the details, but I recall vividly standing looking at the tree wondering how on earth they managed to live there !! And my own grandmother back in Finland, mother to 14 children, lost her family home when her husband lost it in a card game. They lived the rest of their lives in a tiny cottage. She was always knitting socks, even when she was walking, the knitting needles were busy. Incredible, living in a tree! They were made of tough stock back then. I am so thankful that I knew my great grandmothers, not many can say that. In the picture of the four generations, Great Gramma is the one who looks the least stressed and she went through the most hardships. People of that calibre often are the most grounded, practical and happy. They just get on with life without making it any more complicated than it needs to be ! I agree: one must never forget the pass in order to appreciate the privileges we enjoy today. Even my own parents’ generation that survived the Spanish Civil War or WWII in many cases, went through hell and hardship for many years afterwards. We seem to take Education, housing, food, travel and leisure for granted these days, when for many people that was just a dream too far. We must always be grateful for the comforts we enjoyed today, Feminism or not. 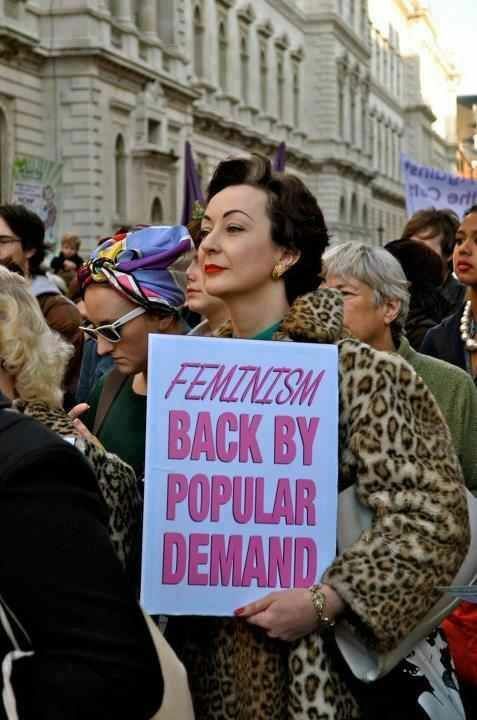 In some ways, these women were feminists well before it was a word, not that they would even look at it that way. They were just trying to survive and keep their family safe. But I must admit, both of my great-grandmothers were the strong member of the marriage team and their husbands knew better than to argue with them! Haha. I can well believe that! Thanks for your very astute comment Fatima. Do you have any stories that you would like to share? Thank you, Bernadette. I have no story to share as such, apart from my Mum bringing up 10 children (5 boys, 5 girls) on a teacher’s salary and then she also housed and looked after my eldest sister’s 2 children. That made 14 of us in a 3-bedroom flat! How did we cope? Respect for one another and team work! When there is a will, there is a way. Most women are in a way or other, but I think in the past they have to be extra brave and strong as they didn’t have the recognition or even the rights we enjoy today. Only the very lucky ones had a high education, most were lucky just to have some basic schooling and as for contraception…. 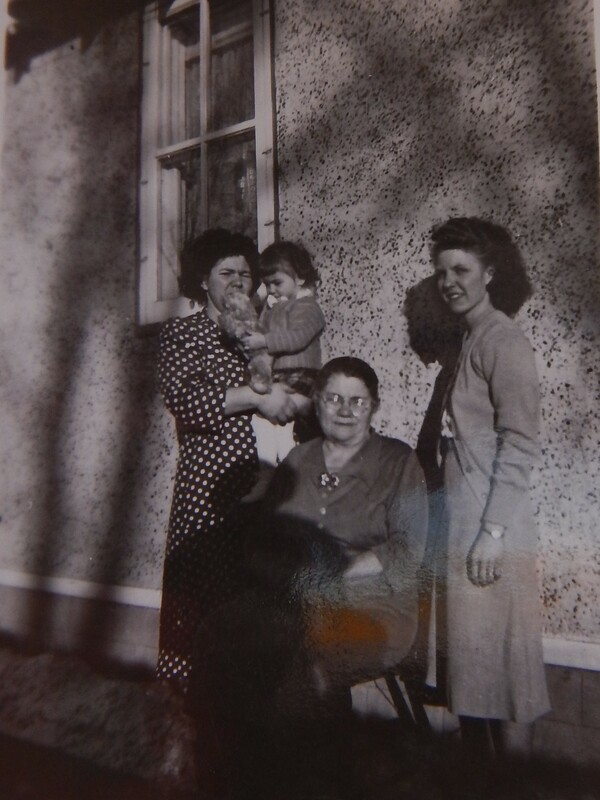 A terrific post about your great grandmothers, Darlene! Our lives seem so easy and pampered by comparison. Thanks for sharing!! I know. I broke a nail cleaning the bathroom today and got upset. Then I thought of my great grandmothers and realized I have it so good. So pleased you enjoyed the post, Debra. Such amazing strengthens these pioneer ladies showed. I’m interested Darlene as in the small town I grew up in Saskatchewan there are Hoffmans. I wonder if they might be related? There is always a possibility, although Hoffman is a very common German surname. On the way out of the airport in Nuremberg, I saw a sign, Hoffman Employment Agency. I laughed as I used to have an Employment Agency in Vancouver. Thanks, Leslie. I hope by writing about these wonderful women, the younger generations will realize what it took to give us the lives we enjoy today. I want to do my small part to keep their memories alive. Great list of adjectives. Do you have a story to tell? I would love to hear it. Ancestry and posterity go hand in hand. This post proves it. Thanks, Darlene. That is a great quote, thanks, Marian. Our family is big on preserving our history as is yours. Hoffman (meaning yard person or gardener) is a very common German name so I’m not surprised you noticed it in Lancaster County as well. They had large families on the prairies at that time. Everyone helped work on the farm, cook, clean and look after the little ones. There are tons of descendants too and we all keep in touch. It is a wonderful family to be part of. Wonderful share, Darlene and Bernadette. These strong pioneering women were amazing, truly the backbones of their families. Stories like this feed my belief that there’s a story in each of us worth being told. Cheers for the long lines of female ancestors who nurtured the next generations. Thanks so much. They were truly amazing and it´s worth keeping their stories alive. What a beautiful tribute to the strong women in your life. It amazes me that you knew them. My great grandmothers and grandfathers all died before I was born. I wish I knew more about their stories — even both my grandmother’s stories. I only remember snippets of stories told and at one time had some letters they wrote, but lost in moves. You have a remarkable “Little House on the Prairie” stories to tell — sod houses. Wow! Have you thought about creating MG books about their lives? Yes, in some ways it is like Little House on the Prairies. I have thought about writing stories for kids based on my history. So many ideas, so little time. Have you read “Kindred Souls” by Patricia MacLachlan? Involves a sod house. I love her books. Thanks, Bette. Glad you enjoyed them. Great story about two amazing ladies and their families. Very inspiring. Thanks for sharing, Darlene! I´m pleased you enjoyed the stories of these two wonderful women as much as I enjoyed sharing them. So glad to celebrate these women. Strong and kind and brave women. I so enjoyed this story about your great grandmothers. You are fortunate to have known them. Thank you! I am so thankful I knew them, even if only a short time. I am also thankful that the family keeps records and meets every 5 years for a huge reunion where we share stories. I’m glad you enjoyed the post, Jennie. How wonderful! Records, photos, and reunions will keep the stories and memories alive for generations to come. And you were lucky to have known them. Hmm… Amanda in Canada? She goes back in time. Oooo! Thanks, Darlene. This is an amazing story, Bernadette. My husband is a Hoffman (adopted) but from the stories he’s told me about his adopted family, they are strong people. So pleased you found the story interesting. Grandmothers can have such a huge impact upon our lives & these have left a bountiful legacy! I pray I leave the same blessed legacy for my grandchildren! I am making a scrapbook for each of my grandchildren of all of the fun times & things we have together, just us. It’s their 18th birthday gift. I have made a calendar for them each year with phots from the previous year. I was thinking of stopping this year but you have inspired me to keep going. I love both of your ideas, Jennifer and Bernadette. The kids will appreciate them all their lives. Jennifer, I have the same prayers that I am leaving a legacy of love for my grandchildren. Watching how they love or at least respect others is an important thing for children to see and learn on a visceral level. I had a very controlling mother-in-law and three little boys. I knew they were watching how I treated her and I knew that I was going to be in her shoes one day. I made sure that they learned the less that you may not always love a family member but they are to be treated with respect. Oh, I’m loving this idea. I have six grandchildren and I so want to make a (beautiful) impact in their lives in some way. Adding a photo album of our times together is a wonderful idea. I keep all the tickets of events, birthday invitations & school concert brochures/items that I am able to attend for them & include all these in the scrapbook as well, they absolutely love it! I also write a short note on each page of that particular time spent together. Otherwise they are just photos of unknown events to the child as they don’t necessarily remember until the story triggers some memory of the event. I’m going to start saving the movie/play/museum stubs now. THANKS!! Thanks for always highlighting such strong women in your posts. Such an inspiration! They are an inspiration and many of them are unsung heroines! Two remarkable women, Darlene. Thanks for sharing. I’m pleased you enjoyed it, Stevie. My cousin just visited my 89-year-old mom in Canada and showed her the post. She loved it! That made me feel good. You’re so very lucky to have known both your great grandmothers. These days, I think it’s sad that many of our children move to other cities, often not particularly near their parents and grandparents. The generational experience you had is lost somewhat lost, through distance. I was very fortunate in that regard. At that time everyone lived in the same community. Even though our family has spread out now, we still manage to keep in touch. Thankfully, with social media, I am able to maintain a close relationship with my grandchildren and great-grandchildren. It’s encouraging to hear you’re keeping in touch with grandchildren and great-grandchildren through social media. I might be facing something like that in a few years, and I fear it won’t be the same or as rewarding as being in touch in person. This is an incredible story of endurance, strength and determination. The settlers had a very hard life. I am writing a book about my Mother’s life as a young girl growing up in an English town during WWII. Her family’s life was also incredibly hard with the rationing, freezing cold and bombing. Good for you! I look forward to reading that book once you finish writing it, Robbie. Anytime you want to share a snippet of the story at Feminist Friday, just let me know. Your next book about your mother sounds wonderful. I have always been grateful that I have never lived through a war. It must have been very difficult. By immigrating to Canada when they did, my family missed both wars. Very fortunate, Darlene. It was very hard times for the English people and, I have read, for everyone else involved. Simply fabulous. Really enjoyed reading it – no one could so and not feel inspired. Most of us are so lucky these days; when things seem a little tough, we should cast our minds back to the fortitude and achievements of those that went before us. We are all children of survivors in some ways. But the uncertainty of being an immigrant was – and still is – unique. You must be very proud. I am very proud and honoured to be part of this family. Thanks for your kind comments. Oh my gosh, I’m crying as I read these incredible stories of two brave, strong, amazing women — your ancestors, Darlene. What makes me mad is how little we hear about/read about the bravery, tenacity, love of family of women like these two. Our history books have it all wrong. Thanks so much, Pam. I am touched by your words. I do believe women were instrumental in building both of our countries. These two women worked side by side of their husbands to create a good life for those who came after. This was amazing, my dear grandmother was from Saskatchewan and when she met my granddad in a dance hall whilst over with the air force, she began courting him and eventually married him. She did move over to England but both my grandma and grandpa missed the life and actually returned there for two arduous years, the winters running the farm was too much and they were not making any money and hence returned to England, where my granddad still resides and unfortunately my grandma past away in 2015. I miss her so much, she so inspired me as she too had 3 children who she moved back and to England and then went on to have another two, which one of them turned out to be my mother. Thanks for sharing the story of your Grandmother. She had great love and strength. When I read your article, it felt like your grandma was my grandma’s friend, it re-opened a part of my heart that I thought had vanished when she past away, so thank you. Wow…what a story. There is no such thing like having ancestors who thrived above all odds to give us have a better life today. Thank you for this inspiring story. Loved reading about these wonderful ladies.